Telemedicine represents a powerful tool in the clinic-to-in-home care continuum, allowing patients with neurologic conditions to access specialists despite geographic, disability-, and life-related hurdles. Most simply, teleneurology is an episode of neurologic care (eg, consultation, evaluation, or education) performed at a distance using technology (eg, telephone, computers, tablets, or internet.) In recent years, teleneurology has expanded to improve access to clinical care and research not just for patients with acute strokes, but also for patients with more chronic neurologic conditions including Parkinson’s disease, headaches, epilepsy, and others. Teleneurology is also making inroads in the care of patients with multiple sclerosis (MS). It is increasingly clear that patients with MS access technology routinely. For MS-related care, patients use technology to communicate with clinicians, access educational materials, and seek information and social support from others living with MS. Beyond these MS-focused goals, patients also use technology for the broad spectrum of consumer consumption: social media for connectedness, activity trackers for fitness, video games and movies for fun, and teleconferencing for work. An important advantage of teleneurology is provision of specialized MS care with fewer real and opportunity costs. In a study comparing in-clinic and teleneurology-enabled visits, telemedicine reduced travel burden, including a mean (± SD) travel distance of 160 (± 196) miles, travel cost of $69.30 (± $123.60, range $0-$600), overnight lodging (17% of patients), and air travel. Telemedicine also reduced indirect costs, including time off work (65% of employed patients) and caregiver burden (30% avoided caregiver time off from work/obligations).2 Another study reported that remote delivery of cognitive evaluations for patients with MS saved more than $144 in travel costs and lost wages relative to in-clinic evaluations.3 Beyond the actual encounter, however, larger costs (eg, medications, tests avoided, or relapses prevented) saved via the televideo visit with the MS specialist were not evaluated. The Veterans Administration (VA) system has pioneered use of teleneurology for patients living with MS. Through the highly innovative VA Home Automated Telemanagement (HAT) system for patients with MS, investigators developed a system to enable 4 main components: interactive patient education and counseling, telerehabilitation, remote neurological examination, and patient home-care management. The diagnostic accuracy of teleneurology-enabled disability examinations appears fairly reasonable, especially when expected biases are accounted for. In 2 separate studies (n = 20 for both), VA investigators showed that, with an in-person examiner available to guide the patient, a televideo-enabled disability examination showed reasonable similarity to a criterion-standard in-person Expanded Disability Status Scale (EDSS) examination.1,8 Outside the VA, a separate study (n = 25) compared an in-person EDSS evaluation to a multimodal remote examination that included a video of previously trained participants’ self-administered neurologic evaluation, as well as patient-reported questionnaires and other components.9 A further study, capturing patients with mild or moderate disability (n = 41, EDSS range 0-7, median 2), compared in-person EDSS evaluation with a televideo-enabled EDSS evaluation that did not require an in-person examiner; there was agreement within 1 EDSS point for 88% of the visits compared. 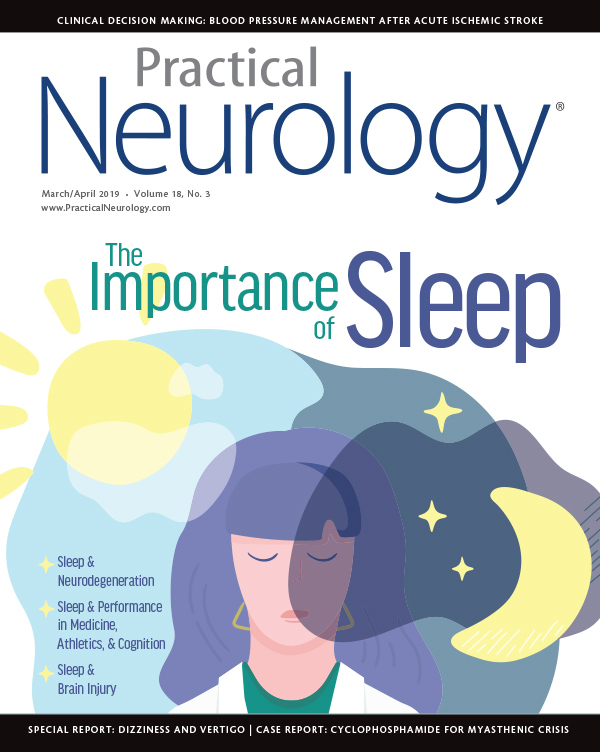 Together, these studies suggest that although imperfect, teleneurology permits reasonable assessment of patients’ overall neurologic function and could be used to categorize patients into low, medium, or high disability levels. It could also be used as an interim assessment tool for determining the need to escalate to a clinic visit and for tracking clinical status changes more frequently if combined with more sophisticated diagnostic tools. Telemedicine is becoming more common in the provision of specialized care for patients with MS. The burgeoning literature to date suggests that this form of medical care is acceptable to patients and clinicians when used within the continuum of clinic-to-in-home care, and that it reduces barriers of access to care. In many cases the neurologic examination performed through a televideo system is suitable to the clinical scenario. A number of promising studies in the area of rehabilitation have shown that through teletechnologies it is feasible to monitor patients in their home environments, and that telerehabilitation interventions could improve both cerebral (eg, mood, cognition, fatigue) and physical function. As teleneurology for MS expands, it will be important to determine whether it yields similar, or even improved, clinical outcomes relative to in-clinic care in terms of relapse prevention, medication safety, and stabilization of MS progression. 1. Wood J, Wallin M, Finkelstein J. Can a low-cost webcam be used for a remote neurological exam? Stud Health Technol Inform. 2013;190:30-32. 2. Bove R, Garcha P, Bevan CJ, et al. Clinic to in-home telemedicine reduces barriers to care for patients with MS or other neuroimmunologic conditions. Neurol Neuroimmunol Neuroinflamm. 2018;5(6):e505. 3. Settle JR, Robinson SA, Kane R, Maloni HW, Wallin MT. Remote cognitive assessments for patients with multiple sclerosis: a feasibility study. Mult Scler. 2015;21(8):1072-1079. 4. Tietjen KM, Breitenstein S. A nurse-led telehealth program to improve emotional health in Individuals with multiple sclerosis. J Psychosoc Nurs Ment Health Serv. 2017;55(3):31-37. 5. Zissman K, Lejbkowicz I, Miller A. Telemedicine for multiple sclerosis patients: assessment using Health Value Compass. Mult Scler. 2012;18(4):472-480. 6. Finkelstein J, Cha E, Wood J, Wallin MT. Predictors of successful acceptance of home telemanagement in veterans with multiple slerosis. Conf Proc IEEE Eng Med Biol Soc. 2013;2013:7314-7317. 7. Finkelstein J, Wood J. Design and implementation of Home Automated Telemanagement system for patients with multiple sclerosis. Conf Proc IEEE Eng Med Biol Soc. 2009;2009:6091-6094. 8. Kane RL, Bever CT, Ehrmantraut M, et al. Teleneurology in patients with multiple sclerosis: EDSS ratings derived remotely and from hands-on examination. J Telemed Telecare. 2008;14(4):190-194. 9. Sola-Valls N, Blanco Y, Sepúlveda M, et al. Walking function in clinical monitoring of multiple sclerosis by telemedicine. J Neurol. 2015;262(7):1706-1713. 10. Turner AP, Roubinov DS, Atkins DC, Haselkorn JK. Predicting medication adherence in multiple sclerosis using telephone-based home monitoring. Disabil Health J. 2016;9(1):83-89. 11. Turner AP, Sloan AP, Kivlahan DR, Haselkorn JK. Telephone counseling and home telehealth monitoring to improve medication adherence: results of a pilot trial among individuals with multiple sclerosis. Rehabil Psychol. 2014;59(2):136-146. 12. Settle JR, Maloni HW, Bedra M, et al. Monitoring medication adherence in multiple sclerosis using a novel web-based tool: a pilot study. Journal Telemed Telecare. 2016;22(4):225-233. 13. Kasschau M, Reisner J, Sherman K, et al. Transcranial direct current stimulation is feasible for remotely supervised home delivery in multiple sclerosis. Neuromodulation. 2016;19(8):824-831. 14. Miller DM, Moore SM, Fox RJ, et al. Web-based self-management for patients with multiple sclerosis: a practical, randomized trial. Telemed J E Health. 2011;17(1):5-13. 15. Block VAJ, Pitsch E, Tahir P, et al Remote physical activity monitoring in neurological disease: a systematic review. PloS One. 2016;11(4):e0154335. 16. Casey B, Coote S, Donnelly A. Objective physical activity measurement in people with multiple sclerosis: a review of the literature. Disabil Rehabil Assist Technol. 2018;13(2):124-131. 17. Block V, A. L, Crabtree-Hartman E, et al. Lower step count assessed using commercially available accelerometry (Fitbit) is associated with MS disability: the FITriMS study. ECTRIMS; 2016; London, UK. 18. Khan F, Amatya B, Kesselring J, Galea M. Telerehabilitation for persons with multiple sclerosis. Cochrane Database Syst Rev. 2015(4):CD010508. 19. Khan F, Amatya B, Kesselring J, Galea MP. Telerehabilitation for persons with multiple sclerosis. a Cochrane review. Eur J Phys Rehabil Med. 2015;51(3):311-325. 20. Amatya B, Galea MP, Kesselring J, Khan F. Effectiveness of telerehabilitation interventions in persons with multiple sclerosis: a systematic review. Mult Scler Relat Disord. 2015;4(4):358-369. 21. Dlugonski D, Motl RW, Mohr DC, Sandroff BM. Internet-delivered behavioral intervention to increase physical activity in persons with multiple sclerosis: sustainability and secondary outcomes. Psychol Health Med. 2012;17(6):636-651. 22. Pilutti LA, Dlugonski D, Sandroff BM, Klaren R, Motl RW. Randomized controlled trial of a behavioral intervention targeting symptoms and physical activity in multiple sclerosis. Mult Scler J Exp Transl Clin. 2014;20(5):594-601. 23. Gutiérrez RO, Galán Del Río F, Cano de la Cuerda R, et al. A telerehabilitation program by virtual reality-video games improves balance and postural control in multiple sclerosis patients. NeuroRehabilitation. 2013;33(4):545-554. RB has served on scientific advisory boards for Roche-Genentech, Sanofi-Genzyme, and Novartis and received research support from the National Multiple Sclerosis Society, Hilton Foundation, Akili Interactive, and the California Initiative to Advance Precision Medicine. VJB has no financial or other relationships relevant to the content to disclose.